Headlines change but investor behavior stays the same. In December of 2007 we published a commentary entitled Surfing with Sharks where we highlighted several indications the markets may be headed for trouble. It had been five years since the tech bubble burst and memories of the devastating 2000-2002 bear market were all but gone. Emboldened by low interest rates and government stimulus programs, risk was back in vogue as bond investors chased record low yields and equity investors were piling into emerging markets. Now five years after the 2007-2008 credit crisis the climate is eerily similar to late 2007. Below is our original commentary from December 2007. In Surfing with Sharks Again- Part II we will compare today’s climate to 2007 and answer the question: After five years, are things really any different? Just north of Santa Cruz, California up Highway 1 there is a hidden gem for surfers. It’s an isolated beach with some nice rights (waves that break from right to left). It’s a steep wave that wraps into a bowl, breaking hard and hollow on big days. “Four Mile”, (creatively named due to it’s proximity of four miles north of Santa Cruz), is an isolated beach and few tourists know about the waves. It’s a long hike down to the cove. The water is cold. But the surf can be amazing. There is just one small problem. Four Mile is dangerously close to one of the largest breeding grounds in the world for Great White Sharks. For the few brave surfers that are willing to bear the danger the rewards can be sweet-Your own private surfing sanctuary. For anyone who has surfed it knows the first few minutes in the water are the most nerve racking. With every dip of the hand to paddle one is sure it will come up missing a few fingers. But the longer you are in the water, the more relaxed you become. And on a good day when the waves are really pumping, the adrenaline from the ride far outweighs what seems like diminishing risks of becoming a shark snack. Wall Street credit investors have behaved much like surfers at Four Mile. Record low interest rates over the past five years have provided an excellent back drop for stocks and real estate. But low rates also mean lower interest payments on Bonds and CDs, and less return for fixed income investors. Five years of relative stability in financial markets have emboldened credit investors to take more on more risk, reaching for more return. When surfing Four Mile, the longer you are in the water the more cavalier you become with the risk. Fear turns to confidence and confidence eventually to arrogance. Just because you can’t see dorsal fins doesn’t mean the sharks aren’t there. And just because Wall Street became more and more comfortable with exotic mortgage and credit products doesn’t mean they were safe. Now that “reach for return” has come back to bite the markets. After a long period of calm, volatility is back. After almost five years of relative calm in the financial markets, volatility has returned. First with a 9 day, 6% drop in the Dow in February and March of this year. A 20 day, 8% decline in July and August. And most recently a 33 day 10% decline in October and November. Each decline lasting a little longer, falling a little more. Yet each decline has been followed with a rally to new higher prices. At least so far. Are we witnessing a character shift in the markets? Small Caps may be giving us a warning. Small Cap stocks are typically an excellent gauge on the economy as they tend to be the most sensitive to economic activity and interest rates. 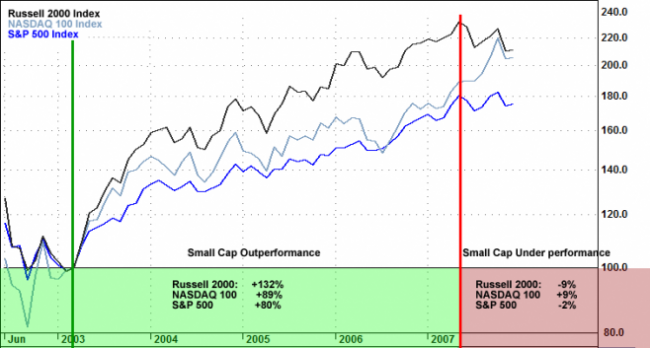 The Russell 2000 Index of Small Cap stocks lead the way out of the last Bear Market, out-performing the S&P 500 Index by almost 50% since March of 2003. The chart below shows a comparison of the Russell 2000, the NASDAQ 100 and the S&P 500 Index. Clearly the Small Cap area has been the place to be for the past 4 years. For the past seven months however, the Russell 2000 has underperformed the NASDAQ 100 and S&P 500. The long term trend of the Russell 2000 appears to be changing, and it may have ominous implications for the markets, and the economy as a whole. 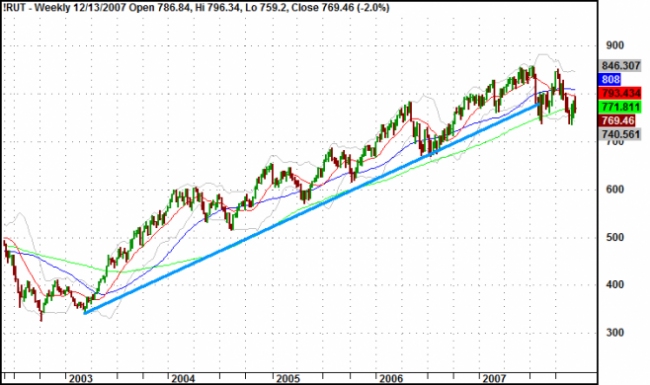 Failure to hold above weekly support may indicate the long term trend of the Russell 2000 trend is in jeopardy. A closer look at the Russell shows it is resting on very important price levels. 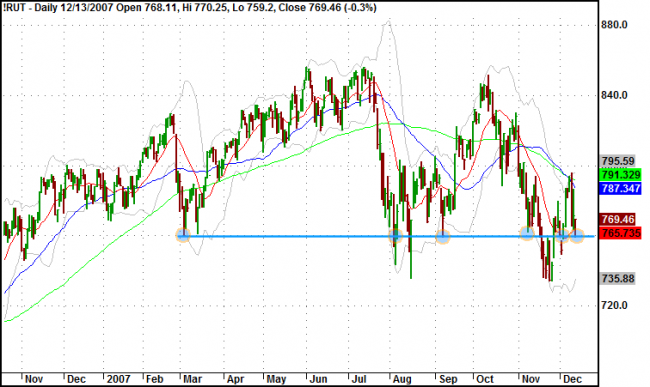 755-760 are the levels that provided support after the March, July-August and November price declines. I believe that a failure to hold the 755-760 level would indicate the end of the 2003 – 2007 price advance on the Russell, and more importantly-a potential end to the recent five year Bull market. Surfing with Sharks- And Living To Tell About It. To the casual observer it might seem ridiculous to take one’s life in your hands surfing shark infested waters. Can the waves be that good to risk death? Not really. There are much better breaks in Santa Cruz than Four Mile. (I’m not sure any wave is worth risking death, but that is another discussion for a different commentary!). Just north of Four Mile also happens to be the largest breeding ground for elephant seals in the world. The truth is that local surfers know that during breeding season the sharks in the water are so fat dumb and delirious from snacking on elephant seals they couldn’t tell a surfer from a rock. The current state of the financial market seems a pretty good analogy. For those who depend on rising markets to produce returns, it probably seems that the sharks are circling. But for those who have strategies to profit in rising and falling markets, the waves look pretty inviting. For the Disciplined, Opportunity Abounds. Our Quantitative approach to portfolio management is really just a fancy term for “calculated risk”. It means we have done the homework long before we ever put on a trade. Rather than react to the heat of the moment- and lately that can mean just about anything- we instead have a game plan that has been tested and proven trustworthy. It would be foolish to assume the future will look exactly like the past. But while not a mirror image to the past, market cycles do indeed repeat, and investor behavior is not likely to change anytime soon. Our trend following and hedging models have given the markets room to fluctuate. Becoming too Bearish too quickly has burned many successful money managers and traders over the past several years.The markets are at a key inflection point. The direction we take from here will most likely set the tone for several quarters.